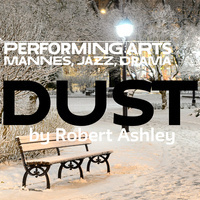 Mannes School of Music at The New School, presents Robert Ashley’s DUST in a new production by William Gustafson and Troy Hourie. Hailed by Zachary Woolfe of the New York Times as “the most tantalizing operatic offering by a New York conservatory this season”, this production of DUST will feature students from The New School’s College of Performing Arts under the musical direction of long-time Ashley collaborator, Joan La Barbara. Composed in 1998, DUST combines live mixing and sound processing, improvisation, and pre-recorded music, all over a libretto based off of the free-associations, conversations, and waking dreams of five “street people.” The highly experimental vocal delivery combines a range of traditional and unconventional vocal techniques, from singing and speaking to mumbling and whispering.